Every leader and company knows the WHAT. They can describe their products, their industry, and their competitors. Some companies also know HOW they do WHAT they do — their unique differentiators, their value proposition, and their values. But few companies know or articulate their WHY — their purpose, their cause or their belief. The WHY is their reason for being. And the WHY is why anyone should care. Since the WHAT is the easiest to know and articulate, most leaders and companies start with WHAT. Sometimes they will also discuss HOW, but they rarely talk about WHY. With respect to the Golden Circle, they go outside-in. Simon advocates that we should invert the order. Go from the inside-out in the Golden Circle. 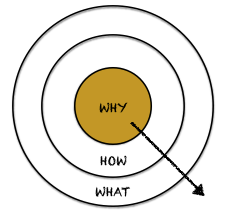 Start with WHY, discuss the HOW, and end with WHAT.